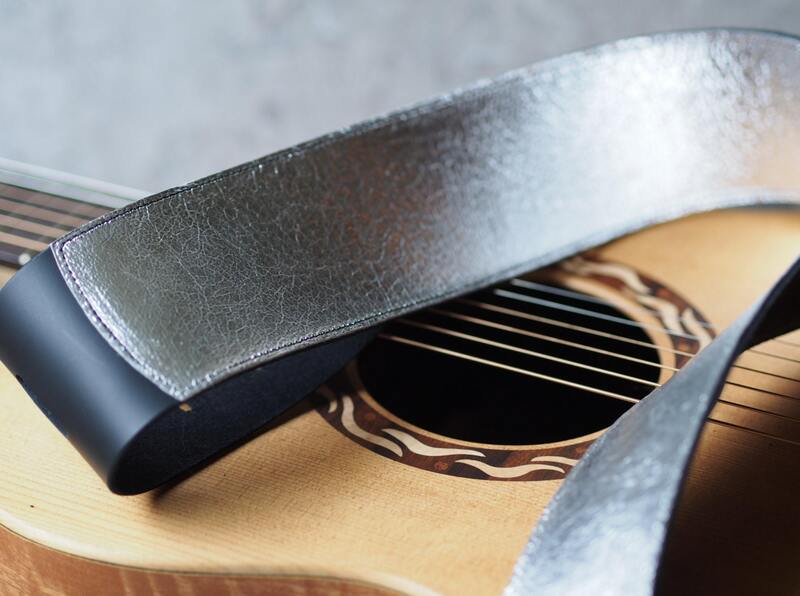 Looks like aluminum foil, but this very soft lambskin has a special finish for a very unique look, but the function of the guitar strap is accomplished with the smooth black elk hide to which the lambskin is applied. The main strap is hand cut to 2 1/2" wide and tapers to about a 1 1/2" radius for the front peg end, and a more gentle taper on the other end with the slots. The Al foil leather is glued and edge stitched to a 1/8" thick black leather, with the last 12" or so of the smooth top grain exposed on the slot end for to contrast the 1" wide adjustment strap of the same black leather so it can weave through the adjustment slots easily, but it is still firm, and will not stretch. (Please note the black leather may vary slightly from as shown in the photo due to stock availability and timing to update photos). 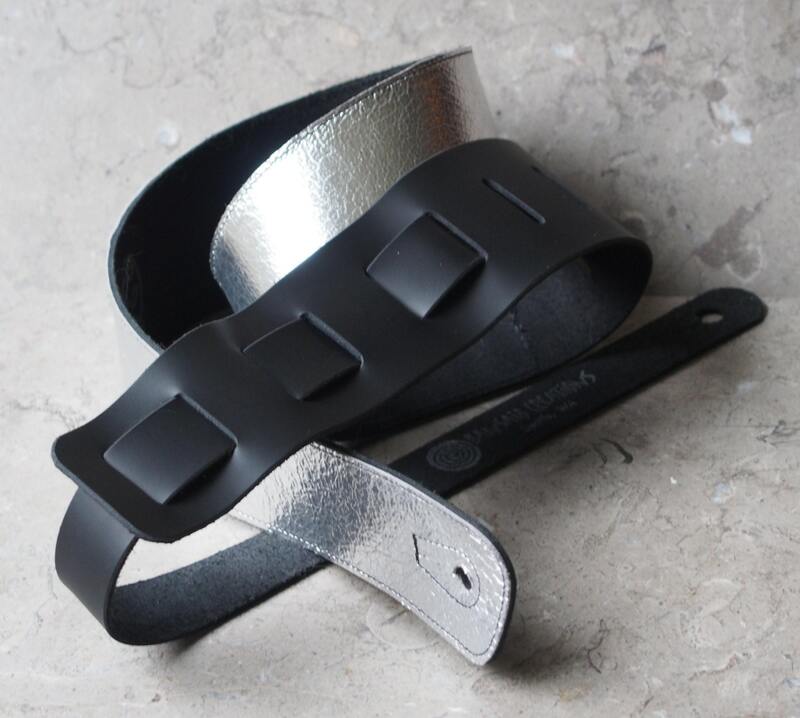 The overall length of this strap as shown is adjustable from 36" to 56". The main strap is about 39" long, and the 10 slots are spaced from about 28" to 38" from the front peg hole. The adjustment strap is 18" from slot to peg hole when installed. I can also provide leather "laces" if you prefer to tie the strap to the neck of the guitar, rather than using a front peg. And if you have a specific peg size you need to fit, please let me know. 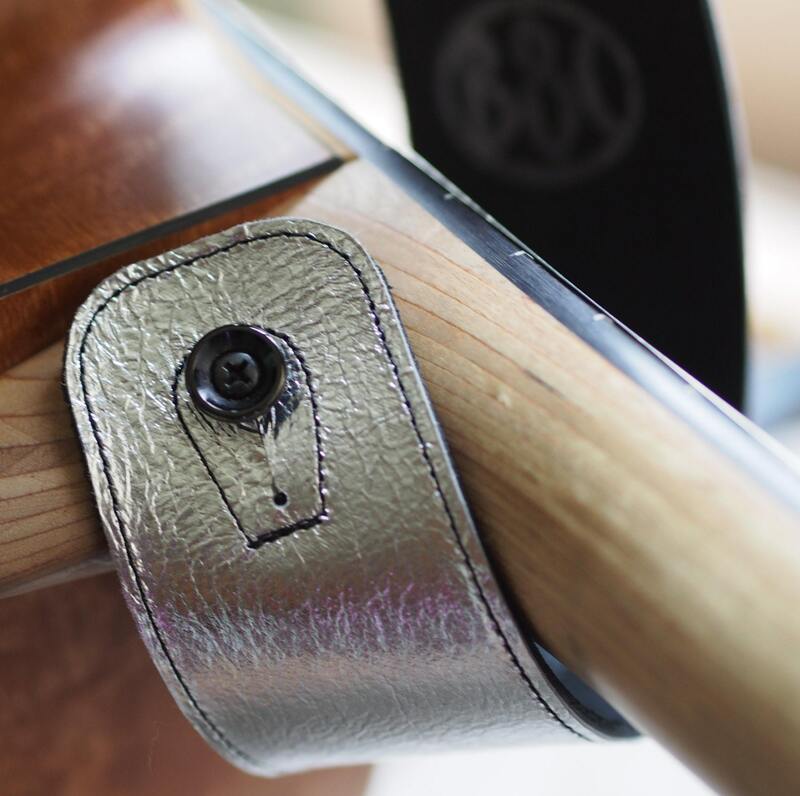 There is no extra charge for enlarging the peg holes or for the ties when you order the strap, but please note in the order if you want any of those changes. And I can make longer or shorter version as suits your fit and playing style. Perfect, lovely, glamorous in a satisfyingly elegant way, startlingly fast shipping too. THANK YOU!!! 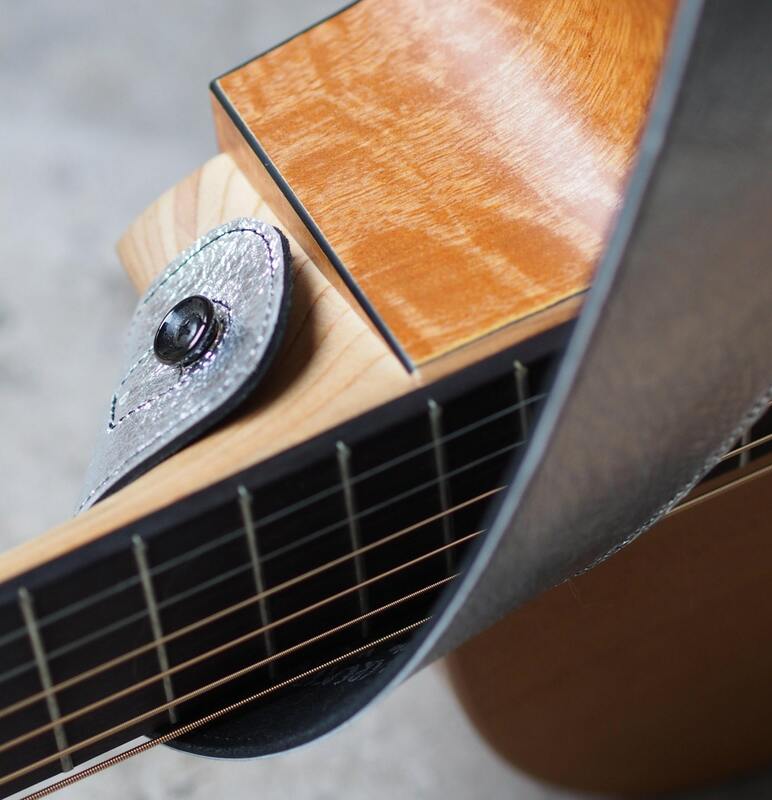 This is my 2nd of these straps, as my newest guitar deserves one if these too. Beautiful guitar strap - thank you Susan! 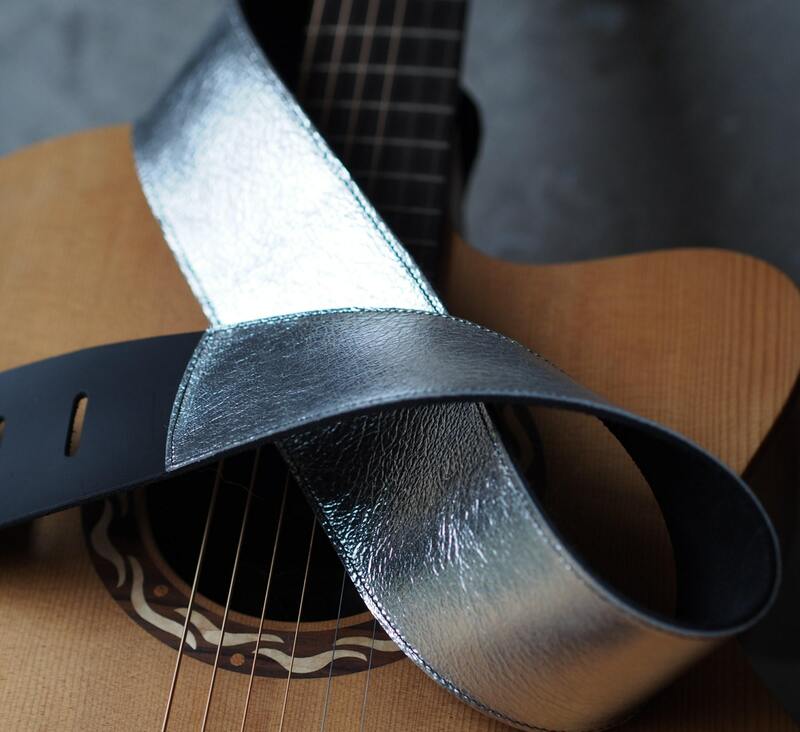 Great silver leather guitar strap. Perfect for me. Thank you!